Thalia Sodi’s new haircare collection, Adria By Thalia. Credit: PRNewsfoto/Adria By Thalia. 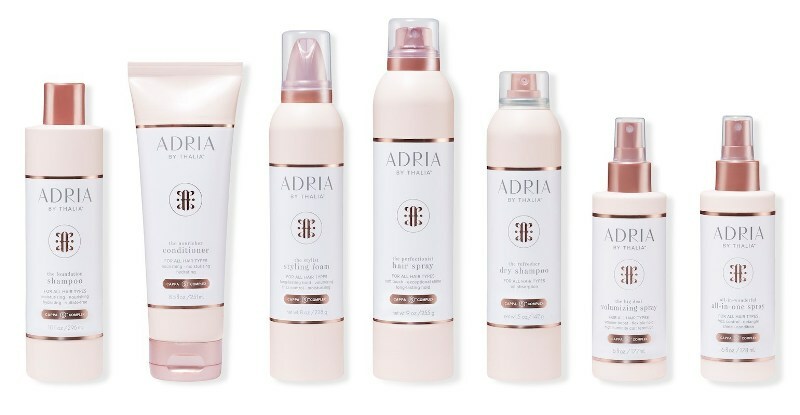 Thalia Sodi has launched a new haircare collection called Adria By Thalia. Its new collection includes a shampoo, a conditioner and five styling essentials comprising an all-in-one spray, a styling foam, volumising spray, a dry shampoo and a hairspray. It was created using the CAPPA 5 Complex, which includes coconut, agave, passion fruit, peony and avocado extracts that feature proteins and amino acids. These ingredients are said to improve the aesthetics and health of hair, as well as maintain hydration and strength and repair damage. Packed in light pink and rose gold packaging, Adria By Thalia is suitable for use in all hair types, including colour-treated hair. The collections fragrances are derived from green leaves, rose petals, sheer musk, apple, pear, aloe, fresh cucumber and violet petals. Sodi said: “My hair has seen it all, from the stage to the studio to the stylist chair. I created Adria by Thalia because I know the transformative effect that great hair can have on your confidence. “Your hair should be as strong, vibrant and full of life as you are. Thalia Sodi is expected to start launching Adria By Thalia within this month in Walmart and select Target locations across the US, as well as online.